Clavicular rotation is a subtle movement but still important. As we lift our arm overhead or move it about it’s ideal for the clavicle to move freely as well. If not then we run into trouble. Excessive stress builds up and eventually symptoms occur at one of the two ends. On the medial (toward the center of the chest) end the clavicle attaches to the sternum (sternoclavicular joint). The predominant movement here is rotation. 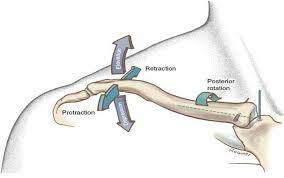 As we raise our arm the clavicle rotates posteriorly (refer above). So we mobilize by compressing a mobility ball into the area and performing shoulder raises. On the lateral (opposite of SC jt.) end the clavicle connects to a portion of the shoulder blade called the acromion (acromioclavicular joint). Here motions are more planer so we mobilize by moving the shoulder in two actions, shoulder raises and shoulder punches.